On May 16, 2018, Odisha Chief Minister Naveen Patnaik will launch his party the Biju Janata Dal's "Save Mahanadi Campaign" against the Chhattisgarh government’s "illegal" obstruction of the Mahanadi river's waters through a number of barrages. 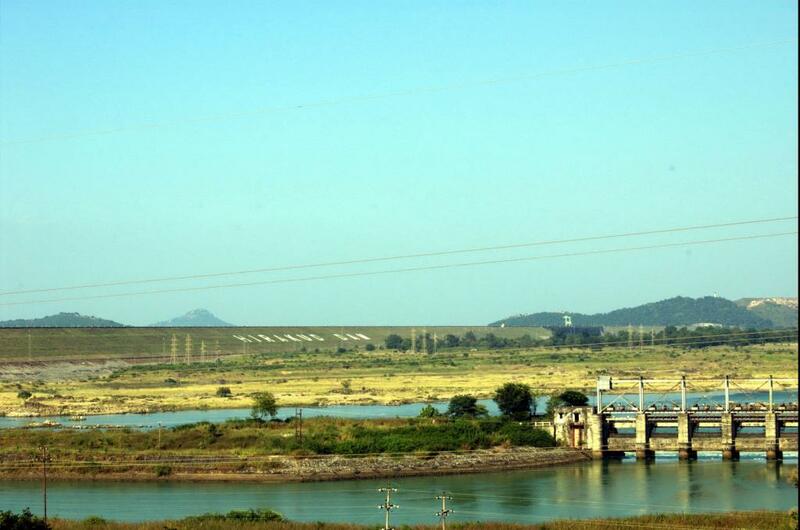 Just four days ahead of that event, the Principal Secretary of Odisha government's Water Resources department had declared that Odisha would construct at least "seven barrages" across the Mahanadi downstream of the Hirakud reservoir. The declaration has evoked responses of varied nature, ranging from jubilant support to total rejection. This declaration by Odisha is significant as the state is in the midst of a bitter dispute with neighbour Chhattisgarh over sharing of Mahanadi water. However, while the planned barrages in Odisha will certainly not affect Chhattisgarh in any manner, they have the potential to influence Odisha in many ways, including its dispute with Chhattisgarh. Keen observers have reacted to this development with two very pertinent questions: (i) If, according to Odisha, construction of barrages across the Mahanadi in Chattisgarh is "illegal" then how can that same action be "legal" in Odisha; and, (ii) If barrages in Chhattisgarh are "killing" the Mahanadi and destroying its ecology, then how will the barrages "save" the river if they are constructed in Odisha? Some other people are questioning the need and timing of the declaration itself and the harm it will cause to Odisha’s brief in the Mahanadi river dispute tribunal. The dispute between Odisha and Chhattisgarh over the Mahanadi began when Odisha alleged that the upper riparian state Chhattisgarh had "illegally" constructed a number of barrages across the river and its tributaries, which had seriously affected inflow into the Hirakud reservoir in Odisha, more so in the non-monsoon seasons. 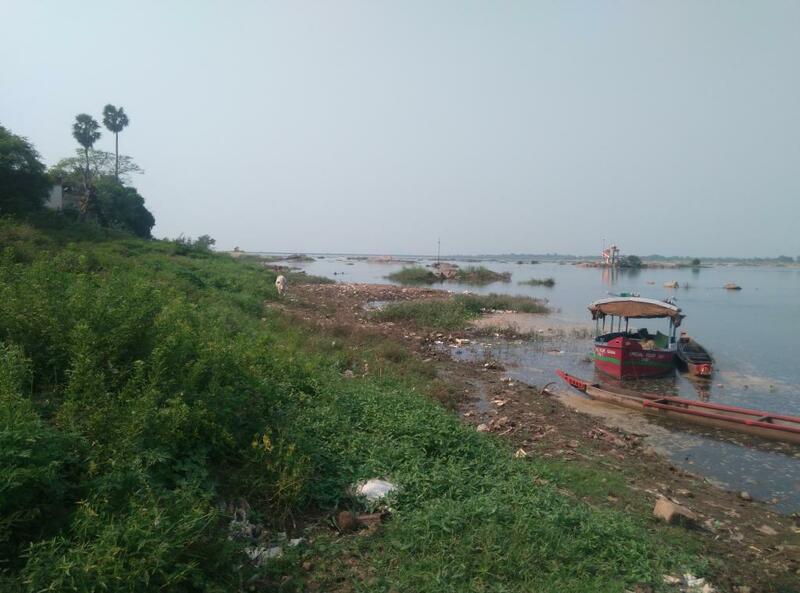 The Odisha government has not only termed the construction of such barrages as "illegal", it has also alleged that such barrages are killing the Mahanadi river. As the matter remained unresolved, the Supreme Court directed the Union government to form a river dispute tribunal. The Union government has subsequently notified the formation of the Mahanadi river dispute tribunal on March 12, 2018. Now, the observers are wondering on with what pleas would Odisha approach the National Green Tribunal (NGT) since Odisha has planned to do the exact same action that it has accused Chhattisgarh of doing. There is always a section which believes that river water draining into the sea is a waste. Such a section was criticising the Odisha government for not following the "good" example of Chhattisgarh. The Bharatiya Janata Party, which is fighting hard to be the principal opposition party in Odisha, is one of the main advocates of such an argument. It seems that the decision of the government to construct seven barrages across the Mahanadi and a further 22 barrages across its tributaries, has come as a reaction to such a thought. But in the process, it has probably damaged its credentials to oppose Chhattisgarh and its vow to "save the Mahanadi". At the heart of the dispute over Mahanadi water lies the huge Hirakud dam and reservoir. Odisha's allegation of reduced flow to the Hirakud reservoir from Chhattisgarh triggered the dispute. The Hirakud dam project has multiple and conflicting objectives. Its main role is to moderate floods in the Mahanadi and hence, it has to remain empty for most of the monsoon season to be ready to accommodate excess water in times of need. The reservoir has many competing users. It has a large direct irrigation command in the western parts of Odisha and a big indirect irrigation command in the deltaic areas in eastern parts of the state. It is one of the important generators of hydro-power in Odisha, a large supplier of water to industrial and urban demands, and also has the objective to ensure flow in the Mahanadi to meet drinking water, ecological and other needs. The location of the Hirakud dam project makes it the crux of the dispute. Almost all of the reservoir’s catchment lies in Chhattisgarh. Interestingly, Odisha and Chhattisgarh give different figures of catchment area share. In the tripartite meeting held in September 2016 between the two sparring states and the Union government, Odisha had informed that 90.6 per cent of the Hirakud reservoir’s catchment lies in Chhattisgarh and 9.4 per cent lies in Odisha. In the same meeting, Chhattisgarh had informed that 87 per cent of Hirakud’s catchment lies in Chhatisgarh and 13 per cent in Odisha. 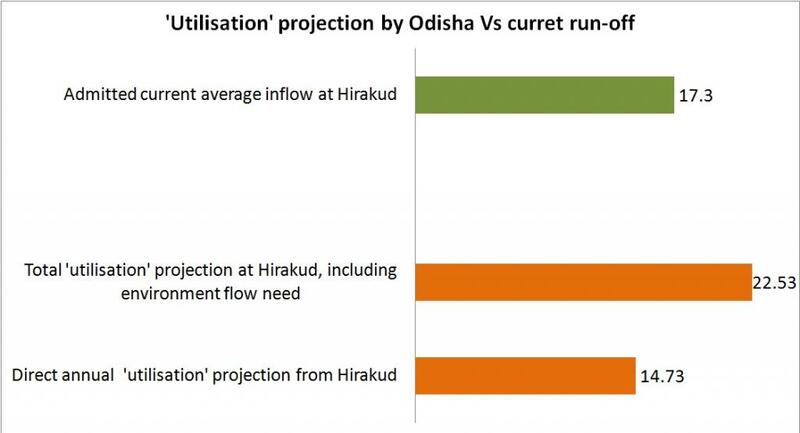 Both the states had very little irrigation coverage and almost no industries when Hirakud was being conceived. Still, the legendary engineer Sir M Vishweshwarya, who was among the first to conceive a project at the Hirakud site, had foreseen the problems of water sharing between Odisha and then Madhya Pradesh. He had clearly emphasised his doubts about possibilities of a large dam project at the Hirakud site as most of the catchment lay in another state. The Hirakud Project Report itself has referred to the Sir M Visvesvarya Committee Report of 1937 which stated that "the proposals under this head are not practicable" because "such reservoirs will have to be outside the province and therefore, beyond the jurisdiction of the Orissa government". Later, engineer A N Khosla, who was the Chairman of the Central Waterways and Navigation Commission and who had visualised the Hirakud dam project, took the lead in persuading Madhya Pradesh to give their consent to the project. Engineer Khosla had convinced Madhya Pradesh stating that the Hirakud project will require a total of 12.28 Million Acre Feet (MAF) water which is significantly less than the recorded minimum annual run-off of 20.61 MAF and about one-fourth of the normal average run-off of 50 MAF at the dam site. About six decades later, the situation has drastically changed. An analysis of information obtained through Right to Information from the government of Odisha reveals that the average annual runoff into the Hirakud reservoir during the decade 2007 to 2016, from all of its catchment area, was a meager 21.951 MAF. This is almost equal to the minimum annual run-off and a mere 43 per cent of annual average run-off assessed by the original Hirakud Dam Project Report. 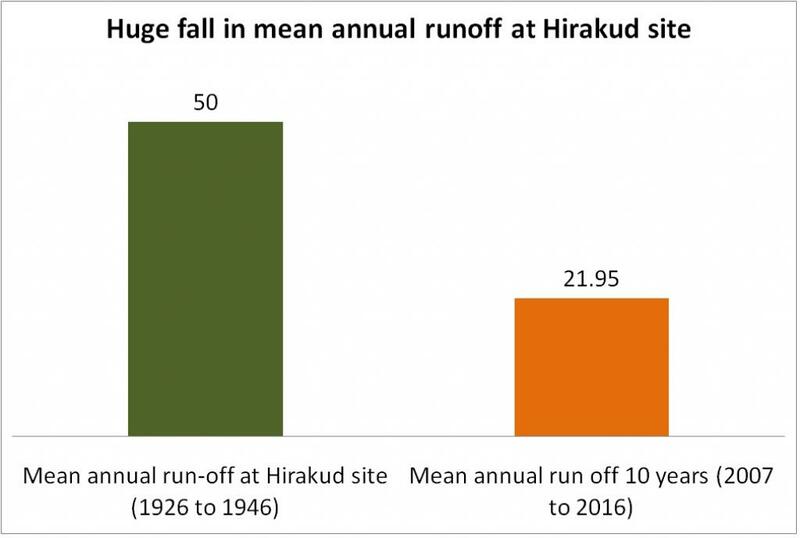 The same information source also indicates that in as many as 20 of the 59 years since 1958, or one in every three years since the commissioning of the Hirakud project, total annual flow at Hirakud has been less than 20.61 MAF, the minimum annual run-off assessed during the original project report. At a time when the run-off at the Hirakud dam site has substantially reduced, the plans of both Odisha and Chhattisgarh to utilise Mahanadi river water belie all rationality. Both states are eyeing rapid industrialisation, by tapping the rich mineral resources of the area, which also are serious water guzzlers. Odisha submitted, in the tripartite meeting of September 2016, that its "planned utilisation" from the Hirakud reservoir for different uses including evaporation loss is 18,175 Million Cubic Metre (MCM) or 14.73 MAF. It said that it needs a further 7.8 MAF for "environmental flow requirements". This total projected utilisation of 22.53 MAF is 83 per cent more than the "total demand" of Hirakud project as was estimated in the dam project report. In the same meeting, Odisha had informed that the current average annual runoff into Hirakud has reduced to 17.3 MAF. Yet, Odisha did put forward a much higher projected utilisation of 22.53 MAF. In other words, Odisha has made an utilisation plan which is much more than the current average run-off it receives at the site. Chhattisgarh’s plans have been equally atrocious. Odisha government has claimed that in a communication to it made on August 27, 2016, Chhattisgarh has informed that it will utilise a total of 33,896 MCM, about 27.48 MAF water through existing, ongoing and future planned projects. The "Integrated Hydrological data book", published by Central Water Commission (CWC), has assessed that the total water potential in the Mahanadi basin is 50.22 MAF. Considering the area share of states in the basin area and rainfall pattern, it can be roughly estimated that total water potential of the Mahanadi basin area in Chhattisgarh state will be about half of the total basin potential. This means that Chhattisgarh has planned to utilise an amount of water that it is not likely to get in a normal year. The Odisha government has quoted CWC sources to further allege that the "planned utilisation" of Chhattisgarh through "ongoing" and "future" projects is about 19.17 MAF which is significantly higher than 15.6 MAF of present average annual run-off from Chhattisgarh. It literally means that Chhattisgarh has made a bizarre plan that expects to use a lot more than the average normal potential of Mahanadi river in the whole state. 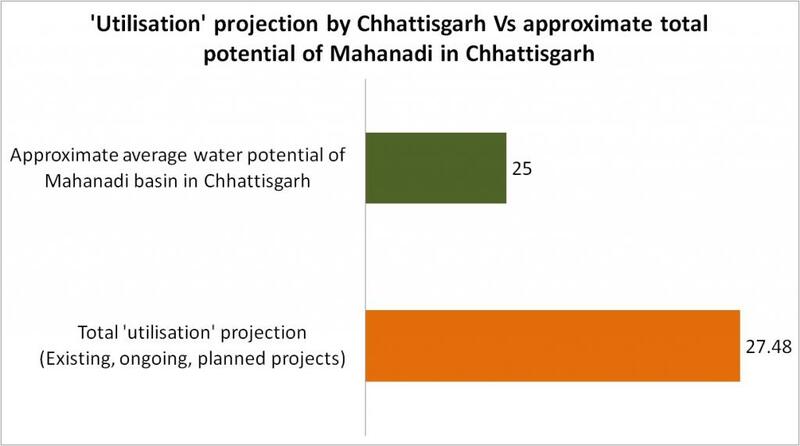 In other words, even if Chhattisgarh stops releasing even a drop of Mahanadi basin area to Odisha, still its projected utilisation will be much higher than the total potential of Mahanadi river in Chhattisgarh. Such "plans" indicate how irrational and irresponsible both Odisha and Chhattisgarh governments have been in planning their "utilisation". Odisha’s declaration of the barrage plan came out suddenly, from almost nowhere. There is no public record of any discussion on it anywhere, either in the Assembly or in the cabinet or in any appropriate forum. A total absence of any information on the nature and scale of the barrage projects across the Mahanadi has added to the confusion over the objectives and motives behind such a declaration. A section of media have cited names of proposed barrage sites. All those sites had been in the news in the past for barrage or dam projects. All past proposals for barrages at those sites had evoked strong public opposition, the most recent being public outrage against the Sindol project in the early years of the current decade. While announcing the plan, the Principal Secretary of the Department of Water Resources simply said that IIT-Roorkee has been asked to study and prepare project reports. This shows that the idea is still in conception stage. That makes the need and timing of declaring the plan of constructing the barrages even hazier, especially in context of the dispute over river water sharing. 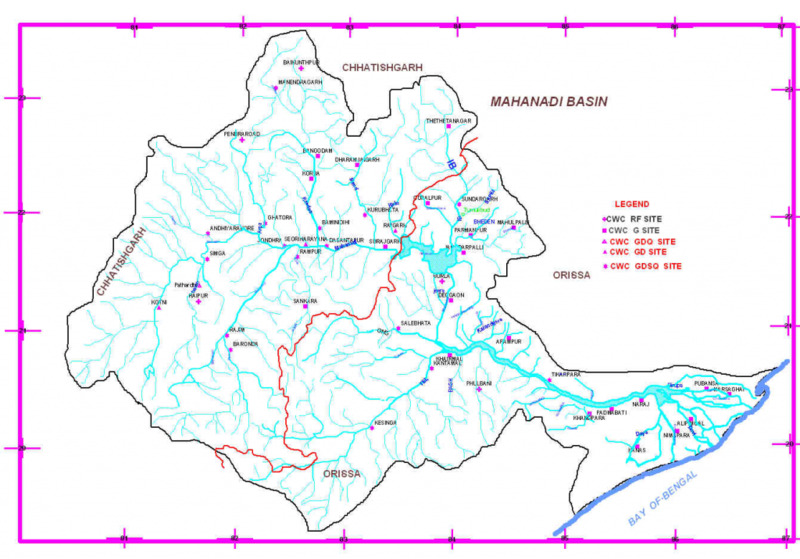 The dispute between two states over an important inter-state river, the constitution of a river dispute tribunal, the plan of Odisha’s ruling party to hold a massive "Save Mahanadi campaign" throughout the basin districts of Odisha state and the sudden declaration of barrage plans has made the issue of the Mahanadi conflict murkier. These developments across the breadth of the Mahandi basin in both the states have serious environmental and ecological ramifications. But, it seems, a vested industry-engineer-politician lobby has started gaining the upper-hand to usurp the river water. It will be interesting to see how the tribunal will take note of these developments. While Odisha was crying that barrages in Chhattisgarh are "killing" the great Mahanadi river, it remains to be seen how it has planned to "save" the river through the same set of actions. Meanwhile, environmentalists are seeing an early death of the river.